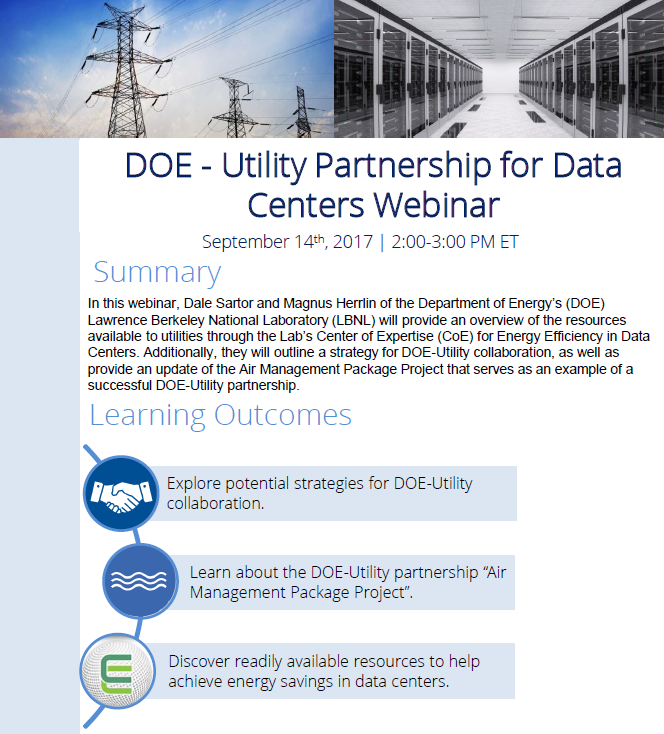 This report is part of the DOE effort to develop methods for measurement in High Performance Computing (HPC) data center facilities and document system strategies that have been used in DOE data centers to increase data center energy efficiency. As data center energy densities, measured in power-use per square foot, increase, energy savings for cooling can be realized by optimizing airflow pathways within the data center. The purpose of this document is to provide recommendations for meeting the energy efficiency requirements for new federal laboratories and data centers, specifically to comply with Executive Order (E.O.) 13423 and EPACT 20051. Guide that builds on prior data center benchmarking studies supported by the California energy Commission. Much of the benchmarking data are drawn from the LBNL data center benchmarking database that was developed from these studies. The Green Data Center Project was a successful effort to significantly reduce the energy use of the National Snow and Ice Data Center (NSIDC). Control software and wireless sensors designed for closed-loop, monitoring and control of IT equipment’s inlet air temperatures in datacenters were evaluated and tested while other datacenter cooling best practices were implemented. Presentation on efficiency opportunities in data centers. The goal of this demonstration was to show how sensors in IT equipment could be accessed and used to directly control computer room air conditioning. In 2005, Sybase conducted an energy audit that revealed that their data center N+1 cooling capacity was at risk due to the center’s rapid growth. Presentation on the computational facility designed for the University of California in Berkeley, CA that was designed to accommodate either air or liquid cooling. This best practice tip sheet has been adapted from “A Quick Start to Energy Efficiency” developed by LBNL. Report analyzes the opportunities for CHP technologies to assist primary power in making the data center more cost-effective and energy efficient. The goal of the project is to encourage the use of air economizers in data centers by developing a framework for making energy and lifecycle cost comparisons for various filtration options and to better understand the impact of climate on data centers.